Having a favorite coffee spot with a whole bunch of locations is something I don't experience a lot. Much like the masses patronize chains because of their convenience, many amazing coffee establishments don't possess a large number of venues usually for problems of cost and fears of oversaturation/overextension. But when I recently hit Vancouver, I found yet another reason to envy the locals as not only do they have a variety of great coffee establishments, but a few of the establishments have numerous locations all over the city, like JJ Bean. A coffeehouse that first started out on Grainville Island, the coffee business now has seven locations, all with very appealing architecture and solid reputations. In my limited travels, I managed to make it to the Main Street location with its glossy, wood-planked exterior and nice spacious windows. The inside has high ceilings, a central fireplace and a nice variety of seating. JJ Bean roasts a vast array of coffee, with the Eastside Blend the coffee that found its way to my cup that morning, producing a smooth drip with a buttery hang and a hint of cherry. The espresso, which the barista pulled wonderfully short, possessed flavors of cocoa, lime and a subtle smoky flavor. I did not see the tea though I'm sure it is offered. I wish I could have tried a few more of the JJ Beans, but alas, I had little time in Vancouver. Next time, I plan to definitely make a stop back as the experience was grand. 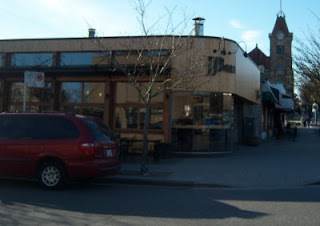 If you're in Vancouver, give one of JJ Bean's venues a whirl. JJ Bean locations don't have wifi, at least not the Main St, Commercial Drive, or Powell locations, unless that is a very recent (ie, in the last couple of weeks) change. Thanks for the notification! Sometimes, little mistakes creep in.